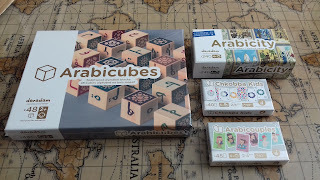 Naturally they wanted to open the Arabicubes first as it was the largest box in the pile. I cannot praise these wooden blocks enough with their beautiful arabesque motifs on one side. 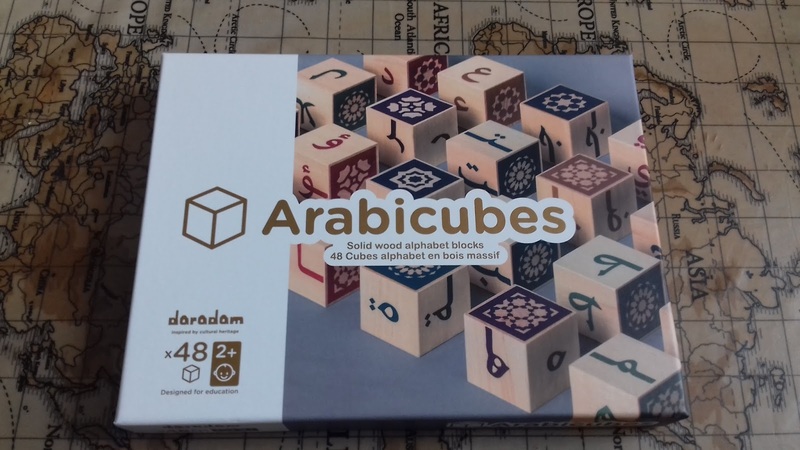 They are of an exceptionally high standard, made from linden wood, and would be a lovely Eid gift for your children or grandchildren. 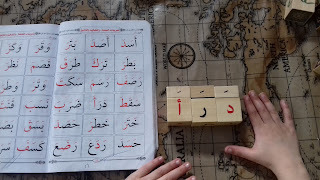 There are 48 blocks consisting of Arabic letters and vowel sounds. Each block has the beginning, middle and end letter design so that your child can flip it in order to identify the letter and understand their different forms which they will come across when reading and writing Arabic. Watch our video here which I uploaded on our 'story highlights'. 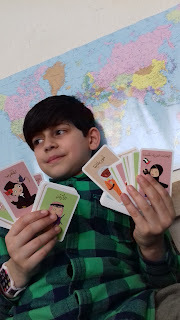 There are themed activity sheets for this game which can be downloaded free of charge from the website here. 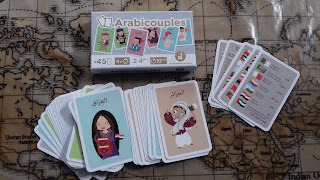 The next game we tried was Arabicouples, a lovely game in order to learn about couples around the world and their traditional clothing. The character on each card holds the flag of their country which children can easily match up. 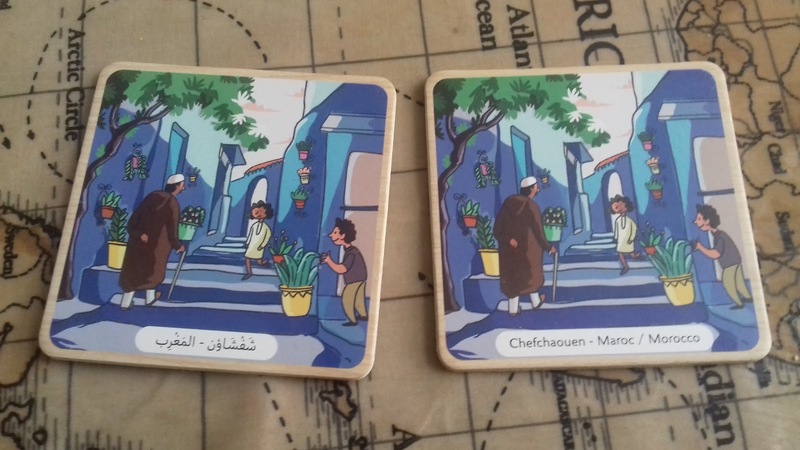 The pack comes with a set of instruction cards in various languages as well as a set of cards with flags and their countries. 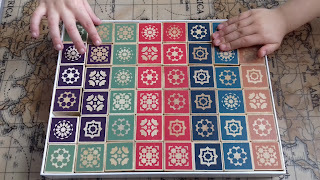 I thought this was going to be a game of snap or a memory game, but no! 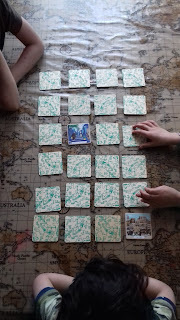 It's a completely new game which was a nice surprise. 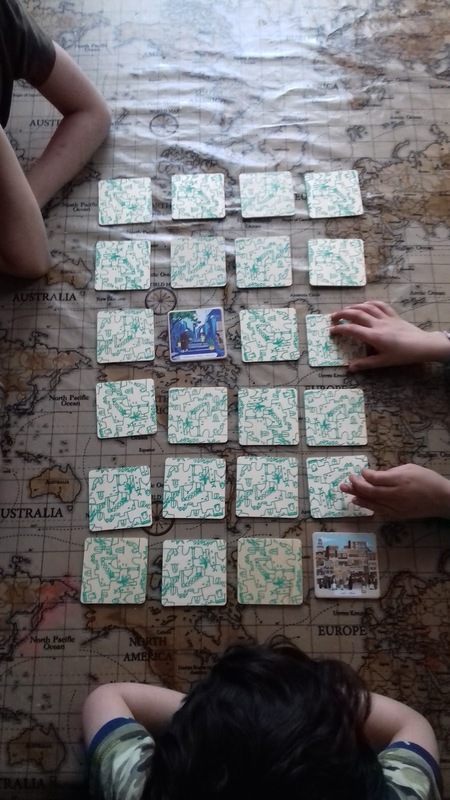 It's for 2-4 players each having a set of cards. After placing the 'couples' they had in their hand, down on the table, they each took turns to choose a card from the player on their left in order to match up more 'couples' learning about different countries and their culture along the way. The winner is the one to match up the most 'couples' but look out for the scorpion along the way!! (try to get rid of him) The kiddies thoroughly loved playing this game and wanted to continue playing throughout the day. I am sure this will be a family favourite for both children and their parents alike! 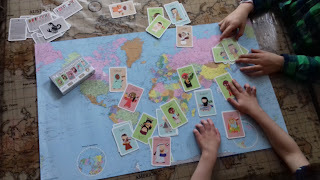 The kiddies actually played the game without squabbling and really enjoyed themselves whilst learning all about which couple came from which country. 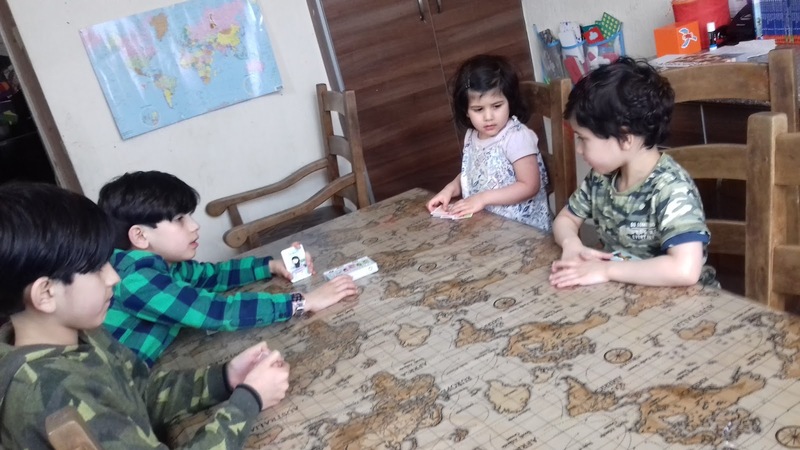 They even pulled the map off the wall in order to try and place couples on their own countries using the flag chart cards. The third game that came out of the box was Arabicity! 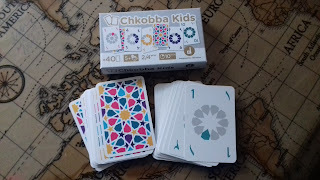 A set of beautiful, thick wooden cards illustrated by Noha Habaieb. 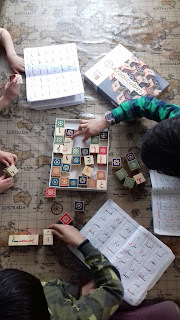 This game is the well known 'Memory game' with a difference! 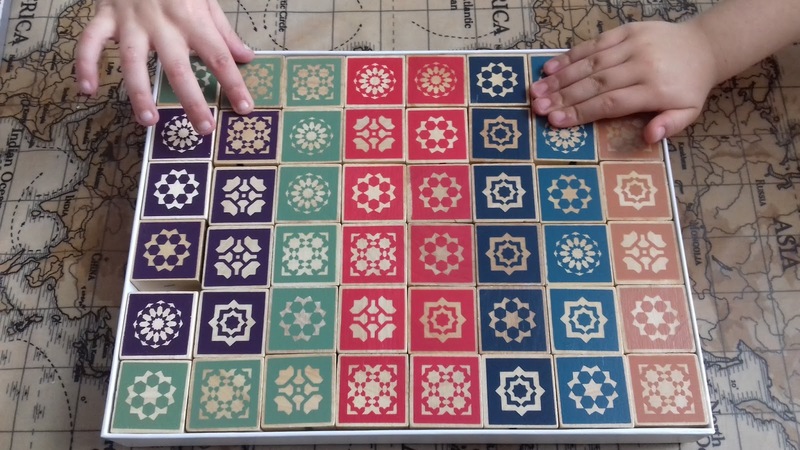 It instructed us to place them face down on the table, taking it in turns to choose two at a time and try to match them up. 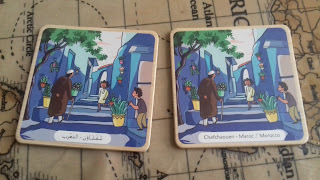 Whilst matching up the pictures the kiddies had to read the cards which are in Arabic and English. 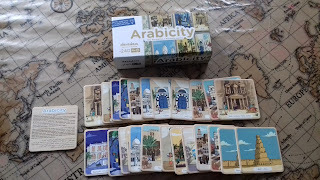 Don't forget to print off your free Arabicity Map on the website here. The last game we tried was Chkobba Kids which was great for the older ones as they could easily grasp the aim of the game. They enjoyed the fact that you had to gain points whilst counting and they all showed great team spirit whilst competing with one another. 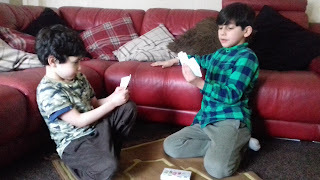 This card game could easily be adapted to make many other games as well as using them as flashcards to learn numbers! Overall, I can honestly say you won't be disappointed with toys from Daradam. With Ramadaan and Eid around the corner why not head over to their website here and see what they have to offer! The games are of exceptionally high quality and I only recommend educational products that I would personally spend my money on. I love the fact that the website offers free printables to go along with the games too! 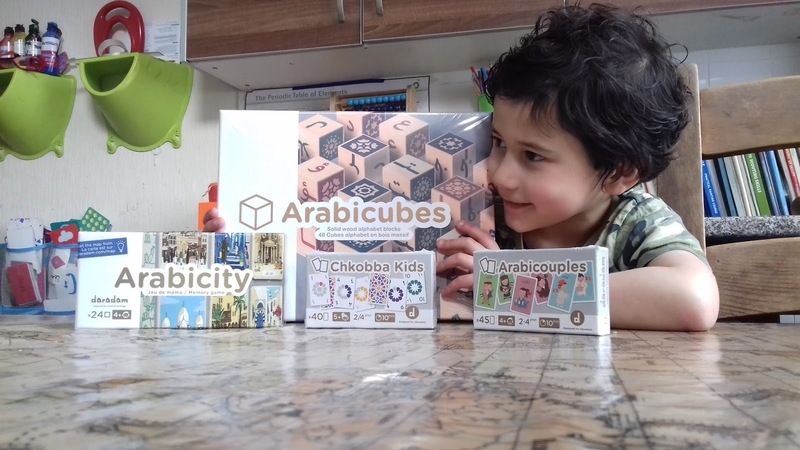 Disclaimer: I was sent these educational products in order to review. I only recommend products I would purchase myself and all opinions are my own. Wow thanks for that post. All those games look great mashAllah. I will definitely be choosing some of those before Ramadan insha'Allah.